Demonstrating its versatility and wide range of products this year, Fischer Panda will also be showing its water maker range on the HRO/Village Marine and Sea Recovery stands. Its integrated mobile power solutions and smart digital switching systems will be represented by Mastervolt/CZone, while Dometic air-conditioning systems and Bellmarine electric drive systems will also feature at the show. As the latest additions to the diesel generator expert’s range of compact gensets, the Panda 4000s Neo and the Panda 5000i Neo are the first to use Fischer Panda’s in-house designed water-cooled FPE320 single cylinder diesel engine. Both generators provide 230V/50Hz AC output and feature the renowned Fischer Panda sound insulation. They run extremely quietly at a noise level of 54db(A) at a distance of 7m. 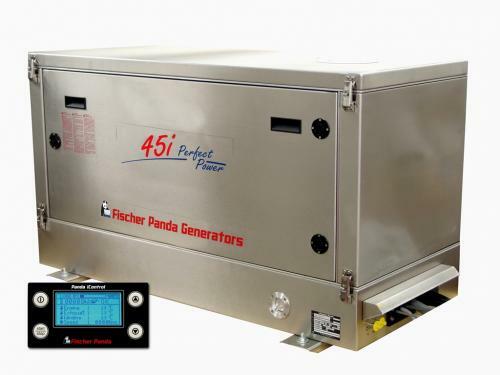 A main focus for Fischer Panda this year is its larger iSeries gensets, such as the Panda 45i (36kW). Featuring technology which allows adjustment to changing power requirements, the range is supplied with PMGi inverters as standard and can be ordered for easy connection in parallel for larger boats. This capability enables a much quieter, lighter and fuel-efficient system, with a larger genset taking care of the main heavy loads and a second generator in reserve to cover peak power demands or for use independently at night. As it continues to enhance its electric propulsion offering for customers, Fischer Panda UK is now the exclusive UK distributor for Bellmarine electric drive systems, adding the Bellmarine DriveMaster and SailMaster systems and accessories to its highly respected range of Fischer Panda ‘Easy Box’ Electric Drive Systems. The systems include the new liquid-cooled range of DriveMaster Ultimate and Modular systems. Bellmarine’s collaboration with Mastervolt ensures complete and fully-integrated electric propulsion systems. Fischer Panda UK will also be highlighting its large Sea Recovery watermakers at METSTRADE after adding the high-capacity, fully-automated Sea Recovery Aqua Matic XL for super and mega yachts to its portfolio this year. 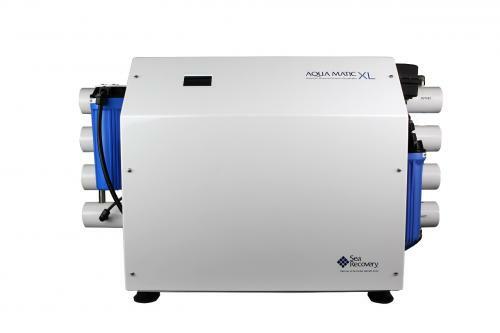 Developed for yachts and vessels requiring large quantities of water quickly and easily, the revolutionary Aqua Matic range regulates and monitors functions, and performs self-maintenance servicing, without the need of an operator. The XL unit features fully-automatic, one-touch operation with full colour screen and optional remote control. It is also equipped with an automated pressure regulating system and Fresh Water Flush to prolong the life of the membranes. The XL version is offered as a higher production alternative to Fischer Panda’s popular range of fully-automated Sea Recovery Aqua Matic systems for boats of 50ft-100ft. To see Fischer Panda UK at METSTRADE, visit the Fischer Panda GmBh Stand 02.500.